When attached to a PicoScope 4444 input the TA299 adaptor connects the Scopes ground reference to the screen of 2 BNC connectors and breaks out the 2 differential inputs to the tips of the BNC connectors (as shown here: https://www.picotech.com/images/uploads ... ematic.png). 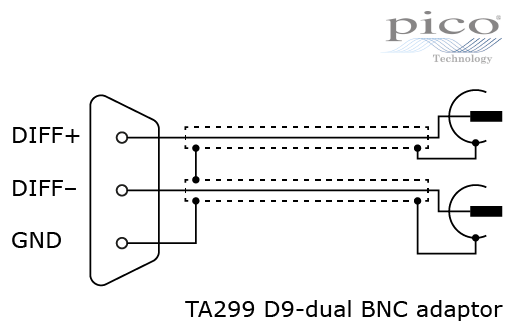 However, the answer to your question is no because, although the 8 BNC connectors become ground referenced, the 4 differential channels to which they are attached remain 4 differential channels. You still need to connect the tips of the 2 probes to 2 test points either side of a voltage that you want to measure (e.g. either side of a resistor to make a high side current measurement) with both ground clips attached to the system ground. The TA299 adaptor sets up the differential measurement to be made with 2 Scope probes, enabling access to 2 test points separated by a comparatively large distance, or 2 test points requiring x10 attenuation. Note that for working with potentially hazardous voltages such as those with an IEC 61010-1 or UL 61010B-1 (UL 31111-1) rating of CAT II or higher (e.g. mains supply voltages) a simple attenuator should not be used. A safe alternative would be a suitably CAT rated differential Probe (e.g. a PicoConnect 442 for CAT III voltages). Note also that by breaking out the differential inputs to single ended probes you lose the benefit of rejecting the same noise signal appearing on both inputs, so the adaptor is best used where noise is not going to be a problem.